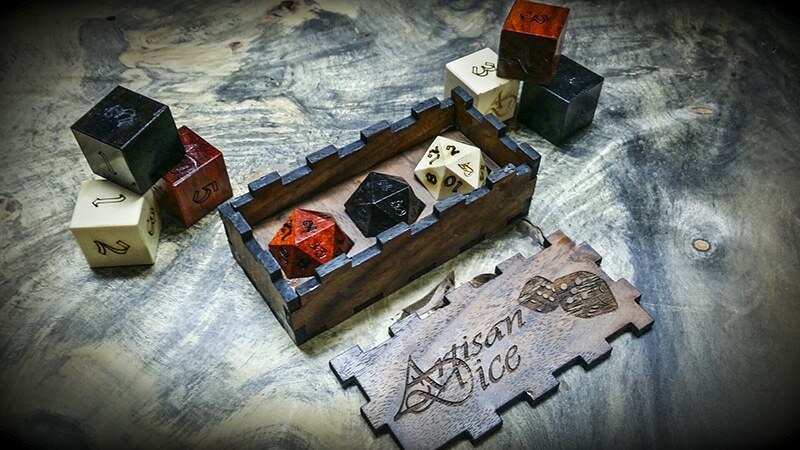 For the final days of our 2 Years of Awesome Celebration, we put together a special run set of either 3d20’s or 3d6’s in our logo’s colors crafted from some of our favorite woods, Bloodwood, American Holly, and Mpingo. We’ve made 10 sets of each type and we’re giving away 2 of the d20 sets and 2 of the d6 sets on our Facebook page today and tomorrow in a game we’re calling Minion Trivia. For those of you not wanting to join in on the Minion Trivia hijinks, you can snag a set below. Each set is number 1 – 10, and comes in a laser cut figured walnut box. This is just a list of woods I almost chose for my kickstarter dice set(s). Wondering if these have shipped?? Been looking for mine in the mail and have not seen them yet. got my notice, will have mice set on Friday, just in time for game night.. TY.